The European Space Agency (ESA) released satellite footage showing how northern Europe’s lush green forests have all turned dry brown in the course of a month just as weather forecasts expect the highest temperature ever measured to be broken this weekend. 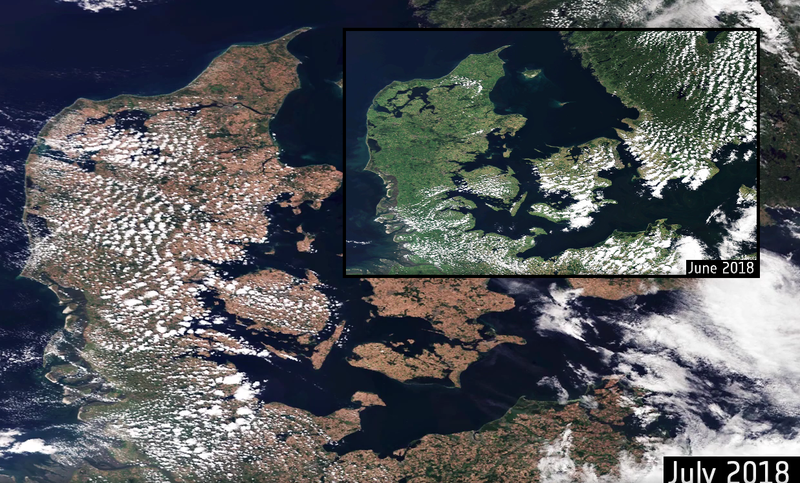 ESA showed images portraying the northern tip of Germany, the western part of Poland and the whole of Denmark, filmed with a month’s interval in June and July, as Europe went through one of its longest droughts on record. Meanwhile, forecast models are showing that the highest European temperature ever recorded, a rare 118.4°F in Greece back in the summer of 1977, could be broken this weekend as temperatures are seat to soar in Portugal and southern Spain. According to this morning’s model, southwestern Spain and southern and southeastern Portugal are set for 116.6°F on both Friday and Saturday because of hot air flowing in from Africa. Meteogroup estimates there to be a 40% chance that Portugal would equal Greece’s record and "a 25-30% chance that we will break the European temperature record." Italy, another Mediterranean vacation destination, also issued red weather warnings to its population. The highest warning level was issued for tourists visiting Rome, Florence and Venice. Related coverage: <a href=" https://thegoldwater.com/news/32867-EU-Farmers-Call-For-Extra-Subsidies-As-Drought-Heatwave-Destroys-Crops ">EU farmers want extra subsidies as drought destroys crops</a>. Earlier this week, temperatures near the arctic circle reached 88.2°F. Europe has historically experienced extreme hot and dry summers. Using a study published June 2018, it shows that the 2018 Drought is not unique and in fact admits many others have happened previously. It shows that droughts have been recorded since 1616 using the earliest obtainable written Scientific climate records kept. Plus Modern Era Droughts have happened in 1858–59, 1921–22, and 1949–50, 2003, 2010, and now 2018. NOTE: the Droughts of 1616, 1893 and 1921 exceed, or are at least equal of those seen now.